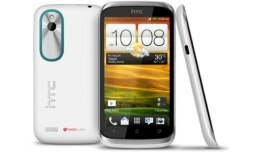 HTC Desire X – What Is Not to Desire about It? ey there, what I have for you today is a special offer. It is for those of you who are not willing to make compromise neither with the quality nor with the money. The rest of you, don’t go anywhere I promise it will be interesting.The phone I am going to show you in this video review is the new budget HTC Desire X. When you first lay your eyes on the machine you will immediately recognize that it belongs to HTC but you certainly will not be able to tell it belongs to the more affordable price category. The model features HTC’s distinctive appearance and design lines. The anodized aluminum signature along the curved lines creates an elegant, high-end appearance. The phone you are looking at is actually Desire C’s successor. You can see for yourself the design and size differences between the two and when it comes to features you find out what this phone has on board just now. The surface on the backside is made of polycarbonate. The size of HTC Desire X is compact with 118.5mm height, 62.3mm width a thickness of only 9.3mm. Its weight is also compact – 114g. The power button is centrally positioned on the top of the body and just next to it you will find the 3.5mm audio output. On the right edge there is a volume controller and on the left a micro USB which plays two roles – it helps you transfer data and at the same time it is a charging port. We can summarize the design with three single words: thin, slim and beautiful. The colors variations are two: black with dark grey and while with silver. The display is maybe one of the most important elements so let’s take a closer look at what HTC Desire X offers. The 4’’ display features the super LCD technology with and 16M colors at 480×600 pixel resolution. These dimensions result in a density of about 233 ppi. The graphics provide vivid colors and great detail. The viewing angle in combination with the strong brightness makes the outdoor exploitation easy. What makes it even easier is the flexible Android 4.0 Ice Cream Sandwich. To that HTC has added HTC Sense v4 – it is a collection of tools, features and innovative user interfaces that enhance your productivity, and provide an ultimate entertainment experience. The hardware characteristics include a dual-core Cortex – A5 chipset working at a 1GHz frequency. It is facilitated by a 1GHz Qualcomm Snapdragon S4 Play. The graphic chipset is a dedicated Adreno 203. Thanks to this hardware the smartphone performs very well, it’s fast and responsive, we didn’t experience any lagging or delays. By default you have a 4GB built-in storage, and you have the option to expand it. There is a micro SD card slot that can provide up to 32GB of storage on your HTC Desire X. The RAM is 768MB. The base camera is 5MP with a maximum resolution of 2592х1944 pixels. The optics feature an aperture that opens up to f/2 and the focal length is 28mm. The smartphone offers a one-press continuous shooting at the capture rate of 2.5 shots per second. We were particularly surprised by the powerful LED flash that works at 5 different levels of flash automatically set according to the subject distance, the cover range of the flash is up to 3 meters. You can use it as lighting even in a video-recording mode. The video output format is WVGA. What is even cooler is that you have the opportunity to shoot video and capture pictures at the same time. HTC has also included a BSI sensor to better your low-light captures. The battery life of HTC desire X is about the average. The 1650mAh Li-On battery provides about 20 hours of intense exploitation and about 800 hours in a standby mode.